The first thing to know is that if you order shingles based solely on the Squares or Square foot area of the roof, you won’t have enough. You will need shingles for starter courses along the eaves and at some rakes, and you will need shingles to cap hips and ridges. You can cut shingles to use as these caps, ridges and starter, as well as cutting at the rakes, against walls and chimneys, and at valleys. This cutting will always cause some waste. Some of the cutoffs will be big enough to use as starter shingles or in other areas where cut shingles are needed, but smaller cutoffs will be waste. Waste can vary from 1-5% depending on the complexity of the roof. The only roof that will generate no waste from cutting is a simple gable roof whose length is divisible by the 3-ft. length of a shingle. 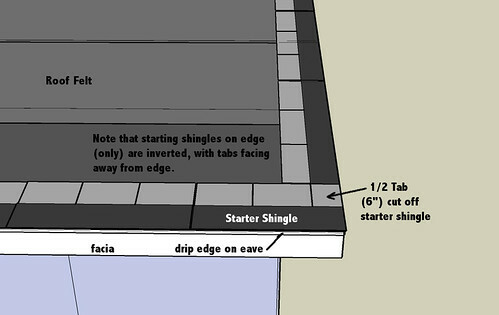 Starter Shingle – is the shingle at the ‘bottom edge’ of the roof with the exposure portion trimmed off, leaving just the self-seal strip and top lap. They are fastened along the eaves edges to seal down the first course of shingles and provide coverage material beneath the tab cutouts just like the top lap of each successive course. Ridge - there are various types, like rapid ridge which provides stronger ridges that are further resistant to damage, stand slightly higher and look nice on your roof cap lines. However in most cases regular shingles are cut to be used as ridge. Standard Ridge (cut shingles) can cap 35 lin. ft. of ridges and hips with each bundle of shingles. Flashing? – 1 roll per job?